There has been a lot of discussion the past few days about that lawsuit filed against NASA for supposedly covering up / failing to investigate evidence of life on Mars by the Opportunity rover. This all has to do of course with that “mystery rock” found by Opportunity, nicknamed Pinnacle Island, which somehow just appeared near the rover (most likely dislodged and kicked up by one of the wheels) a few weeks ago. 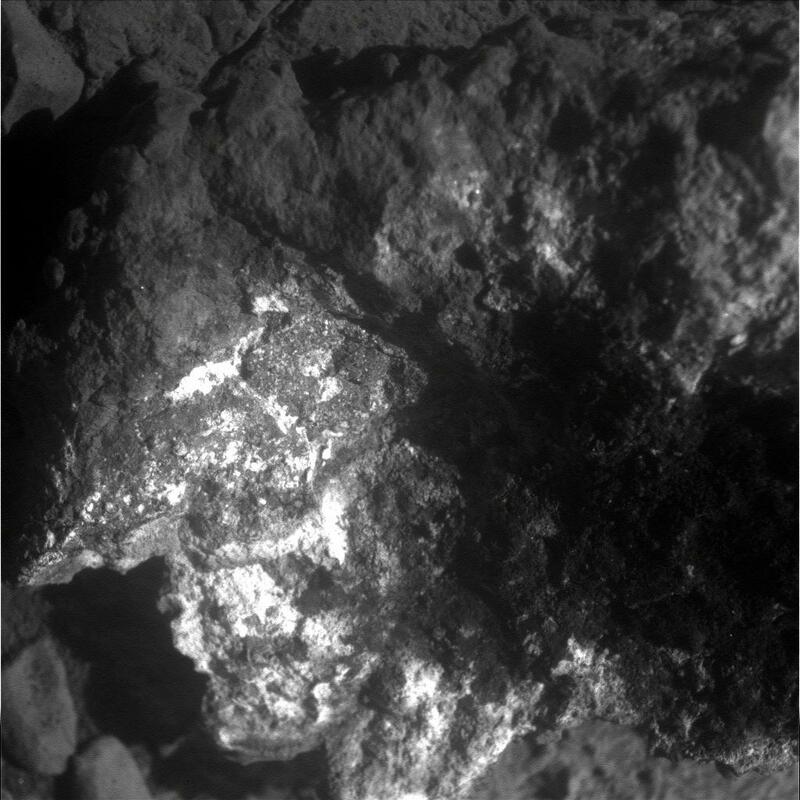 The lawsuit is frivolous for various reasons (as others have already adequately shown), including the fact that the rover has taken numerous Microscopic Imager images of the rock, contrary to what has been alleged. And the rock does look like just that, a rock, not a growing fungus or other plant, unfortunately. That said, this brings up an interesting possibility which hasn’t been mentioned much yet. The rock, as NASA has said, appears to have been flipped upside down from its original position (and mission scientists are still looking for the spot where it came from). That underside has a dark reddish coating of some kind in the middle area which, as known so far from the analysis done, contains large amounts of sulfur, magnesium and even higher amounts of manganese. The outer edges have a whitish coating, which has been seen before on other Martian rocks (at least looks similar). Hence why the rock has also been called a “jelly doughnut” – white around the circumference and dark red in the middle. It is isn’t know yet just what the darker material is, but the unusually larger amounts of manganese in particular is interesting. On Earth, desert varnish also has unusually high concentrations of manganese in it. That is the dark coating which often form on rocks in desert environments. Could this be something similar? It may well not be, but it’s worth consideration. And while desert varnish still isn’t fully understood, it is thought to form with the assistance of microbes. Such a find on Mars would be most interesting. One could speculate even further and say that the dark material could be a form of microbial mat or other very lowly form of life, previously protected on the once-hidden underside of the rock. Less likely perhaps, but not impossible. Another recent study on Earth again showed how some forms of fungus or lichen could easily survive Martian conditions. So the mystery rock is not life itself, and is “just a rock,” but perhaps might still provide clues to what kind of life could have existed on Mars in the past or even still today. The mystery rock may be only a rock, but it might just be a very interesting one. 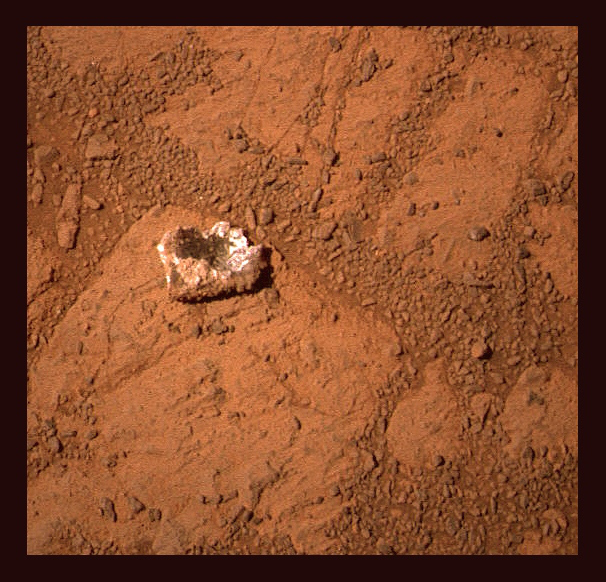 Could Curiosity DELIBERATELY flip rocks which, from above, look SIMILAR to the (now on the ground) BOTTOM of pinnacle island, and if, finding a SIMILAR varnish or possible microbial mat,test for organics? ALSO, if pinnacle island DOES have a microbial mat, shouldnt it die,leaving evidence of shrielling or change in color over the next few weeks? People are truly amazing. First of all, could a fungus of that size grow in such a short period of time, even in optimal conditions? Second, why would NASA “cover up” the discovery of signs of life by a multi million dollar mission which was sent to another planet specifically for that very purpose? All of the conspiracy theorists should crawl back under the rock they slithered out from.